Thompson Smith and Puxon (TSP) was pleased to sponsor an evening with Royal Photographer, Arthur Edwards MBE, hosted by the Essex Agricultural Society, on the evening of Friday 3 March 2017. The event was held at Ingatestone Hall by kind invitation of Her Majesty’s Lord Lieutenant of Essex, Lord Petre. Arthur has been a Royal Photographer for 40 years, travelling to more than 100 countries on 200 plus tours with the Royal Family and when not covering the Royals he’s with the Prime Minister, travelling abroad for high profile events, or behind the scenes at Wembley Stadium for example. Arthur proved to be an excellent speaker and story teller and shared many of his photographs with the audience. It was a very interesting and enjoyable evening. Fiona Ashworth, who leads the TSP Wills and Estates team, is an Essex Agricultural Society Council member and TSP is a corporate member. Fiona attended Arthur’s talk along with TSP Senior Partner Mary Anne Fedeyko. Giving the vote of thanks at the end of the evening Fiona said “I am a true fan of the Royal Family so I was especially pleased to hear that Arthur would be speaking. My interest in the Royal Family goes back to my childhood, when my uncle taught the Prince of Wales during his years at Cambridge, although I have never been lucky enough to meet him as Arthur has. It was a pleasure seeing the great pictures that Arthur has taken over the years and I want to thank him very much for keeping us all entertained this evening. 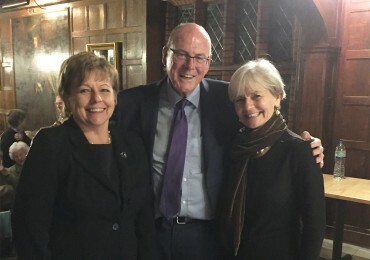 Fiona Ashworth (left) is pictured with Arthur Edwards (centre) and Mary Anne Fedeyko (right). The Essex Agricultural Society has been serving Essex agriculture for 150 years with some 650 farming and associated members. It promotes Essex agriculture and education in the countryside. TSP has been supporting the business of the countryside for many years now too and has long-standing and strong relationships with the rural community in Essex and the surrounding counties. To find out more about how the team can help you click here.